You are invited the luncheon at the Press Club on Tuesday Dec. 16. Come to this luncheon on Dec. 16th to meet and hear this remarkable woman. When: Tuesday, December 16, 2008, 12:30-2:00 p.m.
--1:00 - 2:00 p.m.: The speaker's remarks and Q&A from the audience. Please call Alan Schlaifer at 301-365-8999 if you'd to be able to attend the reception (if there is one) from 12-1230 pm with the speaker. (No guarantee, but early sign up helps). Reservations: $28 for current Wharton Club members and their guests only. You must reserve in advance on our site. We have only a limited number of seats. 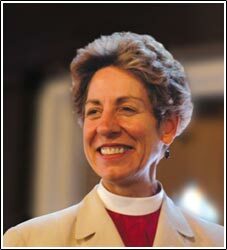 “Shalom” – peacemaking defined by the Prophet Isaiah and reiterated by Jesus in Luke’s gospel – is a ministry priority for Katharine Jefferts Schori, who took office November 1, 2006, as 26th Presiding Bishop and Primate of the Episcopal Church. Bishop Jefferts Schori was elected to this office on June 18, 2006 by vote of the 75th General Convention, in Columbus, Ohio. This Convention also set the United Nations Millennium Development Goals as the Episcopal Church’s top mission priority. In her full endorsement of these goals, Bishop Jefferts Schori calls upon Episcopalians and the wider global community to work together for their implementation. Bishop Jefferts Schori’s career as an oceanographer preceded her studies for the priesthood, to which she was ordained in 1994. She remains an active, instrument-rated pilot – a skill she applied when traveling between the congregations of the Diocese of Nevada, where she was elected bishop in 2000 and ordained to the episcopate February 24, 2001. At the time of her election as bishop of Nevada, she was assistant rector of the Church of the Good Samaritan in Corvallis, Oregon. Bishop Jefferts Schori, 54, holds a B.S. degree in biology from Stanford University (1974), an M.S. (1977) and Ph.D. (1983) in oceanography from Oregon State University, an M.Div. from Church Divinity School of the Pacific (1994), and an honorary D.D. (2001) also from CDSP. Bishop Jefferts Schori was born March 26, 1954, in Pensacola, Florida. She grew up in the Seattle area and later moved with her family to New Jersey. Bishop Jefferts Schori and her husband, Richard Miles Schori, a retired theoretical mathematician (topologist), were married in 1979. They have one adult daughter, Katharine Johanna who is a captain and pilot in the U. S. Air Force. Bishop Jefferts Schori brings to her ministry emphases on baptismal ministry and adult education. As Presiding Bishop, she will serve as chief pastor to the Episcopal Church’s 2.4 million members in 16 countries and 110 dioceses. As Primate, Bishop Jefferts Schori will join in consultation with other principal bishops of the 38 member Provinces of the worldwide Anglican Communion, seeking to make common cause for global good and reconciliation.